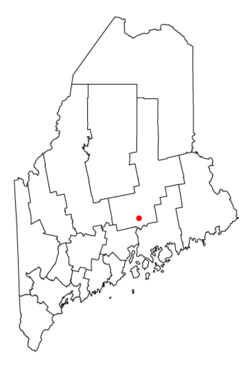 Bangor (/ˈbæŋɡɔːr/ BANG-gor) is a city along the Penobscot River in the U.S. state of Maine. The city proper has a population of 33,039, while the Bangor metropolitan area has a population of 153,746. Bangor is known as the "Queen City" of Maine. Modern Bangor was established by European Americans in the mid-1800s, based on the lumber and shipbuilding industries. As the city was located on the Penobscot River, logs could be floated downstream from the North Maine Woods and processed at the city's water-powered sawmills, then shipped from Bangor's port to the Atlantic Ocean 30 miles downstream, and from there to any port in the world. With their wealth, the lumber barons built elaborate Greek Revival and Victorian mansions and the 31 feet (9.4 m) high statue of Paul Bunyan. Today, Bangor's economy is based on services and retail, healthcare, and education. Bangor has a port of entry at Bangor International Airport, also home to the Bangor Air National Guard Base. Historically Bangor was an important stopover on the great circle air route between the East Coast of the United States and Europe. Bangor's Police Department also has a popular Facebook page, which uses humor and advice in an attempt to better public police relations, which has made national news on multiple occasions. The Penobscot have inhabited the area around present-day Bangor for at least 11,000 years and still occupy tribal land on the nearby Penobscot Indian Island Reservation. They practiced some agriculture, but less than peoples in southern New England where the climate is milder, and subsisted on what they could hunt and gather. Contact with Europeans was not uncommon during the 1500s because the fur trade was lucrative and the Penobscot were willing to trade pelts for European goods. The site was visited by Portuguese explorer Estêvão Gomes in 1524 and by Samuel de Champlain in 1605. The Society of Jesus established a mission on Penobscot Bay in 1609, which was then part of the French colony of Acadia, and the valley remained contested between France and the Kingdom of Great Britain into the 1750s, making it one of the last regions to become part of New England. In 1769 Jacob Buswell founded a settlement at the site. By 1772, there were 12 families, along with a sawmill, store, and school, and in 1787 the population was 567. In September 1787 a petition, signed by 19 residents, was sent to the General Court of the Commonwealth of Massachusetts requesting that this designated area be named "Sunbury". On the back of it was written, "To the care of Dr. Cony, Hallowell". This petition was rejected before 6 October 1788, as the town referred to itself as Penobscot River, west side. In 1779, the rebel Penobscot Expedition fled up the Penobscot River and ten of its ships were scuttled by the British fleet at Bangor. The ships remained there until the late 1950s, when construction of the Joshua Chamberlain Bridge disturbed the site. Six cannons were removed from the riverbed; five of which are on display throughout the region (one was thrown back into the river by area residents angered that the archeological site was destroyed for the bridge construction). In 1790, the Kenduskeag Plantation could no longer defer incorporation from the General Court of Massachusetts and in June Rev. Seth Noble hand delivered the petition for incorporation to the State House in Boston. He left the name for the town blank so he could obtain tentative approval. He chose the name of a popular hymn known to be a favorite of Governor John Hancock. He then wrote in Bangor. The incorporation was received on 25 February 1791 and was signed by John Hancock. During the War of 1812, Bangor and Hampden were looted by the British. Maine was part of the Commonwealth of Massachusetts until 1820, when it voted to secede from the state and was admitted to the Union under the Missouri Compromise as the 23rd state. Bangor was near the lands disputed during the Aroostook War, a boundary dispute with Britain in 1838–39. The passion of the Aroostook War signaled the increasing role lumbering and logging were playing in the Maine economy, particularly in the central and eastern sections of the state. Bangor arose as a lumbering boom-town in the 1830s, and a potential demographic and political rival to Portland, Maine. 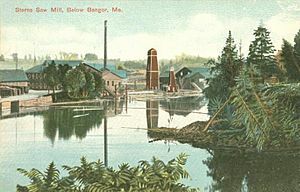 For a time, Bangor was the largest lumber port in the world, and the site of furious land speculation that extended up the Penobscot River valley and beyond. In 1861, after the outbreak of the American Civil War, a Unionist mob attacked and ransacked the offices of the Democratic newspaper the Bangor Daily Union. they threw the presses and other materials thrown into the street and burned. Editor Marcellus Emery escaped unharmed. He did not resume publishing until after the end of the War. During the American Civil War, the locally mustered 2nd Maine Volunteer Infantry Regiment was the first to march out of Maine in 1861. It played a prominent part in the First Battle of Bull Run. The 1st Maine Heavy Artillery Regiment, mustered in Bangor and commanded by a local merchant, lost more men than any other Union regiment in the war (especially in the Second Battle of Petersburg, 1864). The 20th Maine Infantry Regiment held Little Round Top in the Battle of Gettysburg. A bridge connecting Bangor with Brewer is named for Chamberlain, the regiment's leader, who was one of eight Civil War soldiers from Penobscot County towns to receive the Congressional Medal of Honor. Bangor's Charles A. Boutelle accepted the surrender of the Confederate fleet after the Battle of Mobile Bay. A Bangor residential street is named for him. A number of Bangor ships were captured on the high seas by Confederate raiders in the Civil War, including the Delphine, James Littlefield, Mary E. Thompson and Golden Rocket. The Penobscot River Maine North Woods drainage basin above Bangor was unattractive to settlement for farming, but well suited to lumbering. Winter snow allowed logs to be dragged from the woods by horse-teams. Carried to the Penobscot or its tributaries, log driving in the snowmelt brought them to waterfall-powered sawmills upriver from Bangor. The sawn lumber was then shipped from the city's docks, Bangor being at the head-of-tide (between the rapids and the ocean) to points anywhere in the world. Shipbuilding was also developed. Bangor capitalists also owned most of the forests. The main markets for Bangor lumber were the East Coast cities. Much was also shipped to the Caribbean and to California during the Gold Rush, via Cape Horn, before sawmills could be established in the west. Bangorians subsequently helped transplant the Maine culture of lumbering to the Pacific Northwest, and participated directly in the Gold Rush themselves. Bangor, Washington; Bangor, California; and Little Bangor, Nevada, are legacies of this contact. By 1860, Bangor was the world's largest lumber port, with 150 sawmills operating along the river. The city shipped over 150 million boardfeet of lumber a year, much of it in Bangor-built and Bangor-owned ships. In the year 1860, 3,300 lumbering ships passed by the docks. Many of the lumber barons built elaborate Greek Revival and Victorian houses that still stand in the Broadway Historic District. Bangor has many substantial old churches, and shade trees. The city was so beautiful it was called "The Queen City of the East." The shorter Queen City appellation is still used by some local clubs, organizations, events and businesses. In addition to shipping lumber, 19th-century Bangor was the leading producer of moccasins, shipping over 100,000 pairs a year by the 1880s. Exports also included bricks, leather, and even ice (which was cut and stored in winter, then shipped to Boston, and even China, the West Indies and South America). Bangor had certain disadvantages compared to other East Coast ports, including its rival Portland, Maine. Being on a northern river, its port froze during the winter, and it could not take the largest ocean-going ships. The comparative lack of settlement in the forested hinterland also gave it a comparatively small home market. In 1844 the first ocean-going iron-hulled steamship in the U.S. was named The Bangor. She was built by the Harlan and Hollingsworth firm of Wilmington, Delaware in 1844, and was intended to take passengers between Bangor and Boston. On her second voyage, however, in 1845, she burned to the waterline off Castine. She was rebuilt at Bath, returned briefly to her earlier route, but was soon purchased by the U.S. government for use in the Mexican–American War. Bangor continued to prosper as the pulp and paper industry replaced lumbering, and railroads replaced shipping. Local capitalists also invested in a train route to Aroostook County in northern Maine (the Bangor and Aroostook Railroad), opening that area to settlement. Bangor's Hinkley & Egery Ironworks (later Union Ironworks) was a local center for invention in the 19th and early 20th centuries. A new type of steam engine built there, named the "Endeavor", won a Gold Medal at the New York Crystal Palace Exhibition of the American Institute in 1856. The firm won a diploma for a shingle-making machine the following year. In the 1920s, Union Iron Works engineer Don A. Sargent invented the first automotive snow plow. Sargent patented the device and the firm manufactured it for a national market. Bangor is located at (44.803, −68.770). According to the United States Census Bureau, the city has a total area of 34.59 square miles (89.59 km2), of which 34.26 square miles (88.73 km2) is land and 0.33 square miles (0.85 km2) is water. A potential advantage that has always eluded exploitation is the city's location between the port city of Halifax, Nova Scotia, and the rest of Canada (as well as New York). 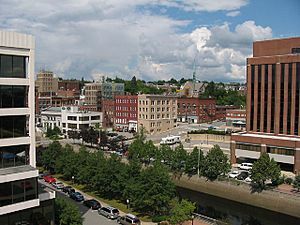 As early as the 1870s, the city promoted a Halifax-to-New York railroad, via Bangor, as the quickest connection between North America and Europe (when combined with steamship service between Britain and Halifax). A European and North American Railway was actually opened through Bangor, with President Ulysses S. Grant officiating at the inauguration, but commerce never lived up to the potential. 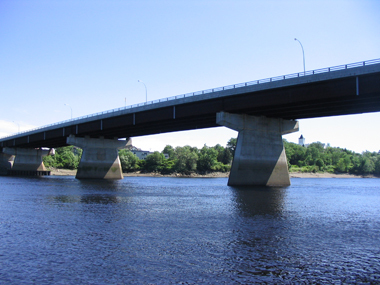 More recent attempts to capture traffic between Halifax and Montreal by constructing an East–West Highway through Maine have also come to naught. Most overland traffic between the two parts of Canada continues to travel north of Maine rather than across it. 1856: A large fire destroyed at least 10 downtown businesses and 8 houses, as well as the sheriff's office. 1872: Another large downtown fire, on Main St., killed 1 and injured 7. The Adams-Pickering Block (architect George W. Orff) replaced the burned section. In the Great Fire of 1911, a fire started in a hay shed and spread to the surrounding downtown buildings and blazed through the night into the next day. When the damage was tallied, Bangor had lost its high school, post office & custom house, public library, telephone and telegraph companies, banks, two fire stations, nearly a hundred businesses, six churches, and synagogue and 285 private residences over a total of 55 acres. The area was rebuilt, and in the process became a showplace for a diverse range of architectural styles, including the Mansard style, Beaux Arts, Greek Revival and Colonial Revival, and is listed on the National Register of Historic Places as the Great Fire of 1911 Historic District. 1914: The Bangor Opera House burned down, and two firemen were killed by a collapsing wall. A third was badly injured, and three others less seriously. The destruction of downtown landmarks such as the old city hall and train station in the late 1960s Urban Renewal Program is now considered to have been a huge planning mistake. It ushered in a decline of the city center that was accelerated by the construction of the Bangor Mall in 1978 and subsequent big-box stores on the city's outskirts. Downtown Bangor began to recover in the 1990s, with bookstores, cafe/restaurants, galleries, and museums filling once-vacant storefronts. The recent re-development of the city's waterfront has also helped re-focus cultural life in the historic center. 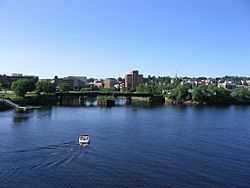 Bangor is on the banks of the Penobscot River, close enough to the Atlantic Ocean to be influenced by tides. Upstream, the Penobscot River drainage basin occupies 8,570 square miles in northeastern Maine. Flooding is most often caused by a combination of precipitation and snowmelt. Ice jams can exacerbate high flow conditions and cause acute localized flooding. Conditions favorable for flooding typically occur during the spring months. In 1807 an ice jam formed below Bangor Village raising the water 10 to 12 feet above the normal highwater mark and in 1887 the freshet caused the Maine Central Railroad Company rails between Bangor and Vanceboro to be covered to a depth of several feet. Bangor’s worst ice jam floods occurred in 1846 and 1902. Both resulted from mid-December freshets that cleared the upper river of ice, followed by cold that produced large volumes of frazil ice or slush which was carried by high flows forming a major ice jam in the lower river. In March of both years, a dynamic breakup of ice ran into the jam and flooded downtown Bangor. Though no lives were lost and the city recovered quickly, the 1846 and 1902 ice jam floods were economically devastating, according to the Army Corps analysis. Both floods occurred with multiple dams in place and little to no ice-breaking in the lower river. 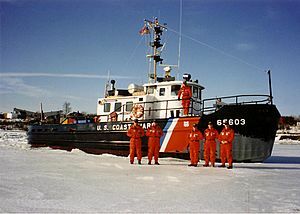 The United States Coast Guard began icebreaker operations on the Penobscot in the 1940s, preventing the formation of frozen ice jams during the winter and providing an unobstructed path for ice-out in the spring. Long-term temperature records show a gradual warming since 1894, which may have reduced the ice jam flood potential at Bangor. In the Groundhog Day gale of 1976 a storm surge went up the Penobscot, flooding Bangor for three hours. At 11:15 am, waters began rising on the river and within 15 minutes had risen a total of 3.7 metres (12 ft) flooding downtown. About 200 cars were submerged and office workers were stranded until waters receded. There were no reported deaths during this unusual flash flood. Bangor has a humid continental climate (Köppen Dfb), with cold, snowy winters, and warm summers, and is located in USDA hardiness zone 5a. The monthly daily average temperature ranges from 17.0 °F (−8.3 °C) in January to 68.5 °F (20.3 °C) in July. On average, there are 21 nights annually that drop to 0 °F (−18 °C) or below, and 57 days where the temperature stays below freezing, including 49 days from December through February. There is an average of 5.3 days annually with highs at or above 90 °F (32 °C), with the last year to have not seen such temperatures being 2014. Extreme temperatures range from −32 °F (−36 °C) on February 10, 1948 up to 104 °F (40 °C) on August 19, 1935. The average first freeze of the season occurs on October 7, and the last May 7, resulting in a freeze-free season of 152 days; the corresponding dates for measurable snowfall, i.e. at least 0.1 in (0.25 cm), are November 23 and April 4. The average seasonal snowfall for Bangor is approximately 66 inches (170 cm), while snowfall has ranged from 22.2 inches (56 cm) in 1979–80 to 181.9 inches (4.62 m) in 1962−63; the record snowiest month was February 1969 with 58.0 inches (147 cm), while the most snow in one calendar day was 30.0 inches (76 cm) on December 14, 1927. Measurable snow occurs in May occurs about one-fourth of all years, while it has occurred just once (1991) in September. A snow depth of at least 3 in (7.6 cm) is on average seen 66 days per winter, including 54 days from January to March, when the snow pack is typically most reliable. 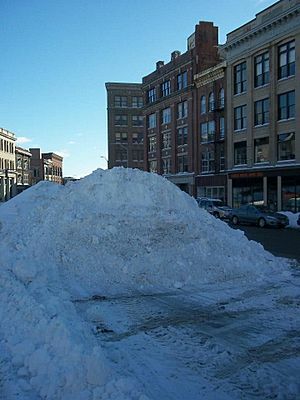 Snow piles in downtown Bangor. Historically Bangor received many immigrants as it industrialized. Irish-Catholic and later Jewish immigrants eventually became established members of the community, along with many migrants from Atlantic Canada. Of 205 black citizens who lived in Bangor in 1910, over a third were originally from Canada. As of the census of 2010, there were 33,039 people, 14,475 households, and 7,182 families residing in the city. The population density was 964.4 inhabitants per square mile (372.4/km2). There were 15,674 housing units at an average density of 457.5 per square mile (176.6/km2). The racial makeup of the city was 93.1% White, 1.7% African American, 1.2% Native American, 1.7% Asian, 0.3% from other races, and 2.0% from two or more races. Hispanic or Latino of any race were 1.5% of the population. There were 14,475 households of which 24.2% had children under the age of 18 living with them, 32.8% were married couples living together, 12.6% had a female householder with no husband present, 4.2% had a male householder with no wife present, and 50.4% were non-families. 37.9% of all households were made up of individuals and 12.4% had someone living alone who was 65 years of age or older. The average household size was 2.10 and the average family size was 2.76. The median age in the city was 36.7 years. 17.8% of residents were under the age of 18; 16% were between the ages of 18 and 24; 26% were from 25 to 44; 25.8% were from 45 to 64; and 14.4% were 65 years of age or older. The gender makeup of the city was 48.2% male and 51.8% female. One of the country's oldest fairs, the Bangor State Fair has occurred annually for more than 150 years. Beginning on the last Friday of July, it features agricultural exhibits, rides, and live performances. The University of Maine Museum of Art and the Maine Discovery Museum, a major children's museum was founded in 2001 in the former Freese's Department Store. The Bangor Historical Society, in addition to its space exhibit, maintains the historic Thomas A. Hill House. The Bangor Police Department has a police museum with some items dating to the 18th century. Fire Museum at the former State Street Fire Station. The Cole Land Transportation Museum. The Thomas Hill Standpipe, a shingle style structure. The Hammond Street Congregation Church. The St. John's Catholic Church. The Bangor House Hotel, now converted to apartments, is the only survivor among a series of "Palace Hotels" designed by Boston architect Isaiah Rogers, which were the first of their kind in the United States. The country's second oldest garden cemetery, is the Mt. Hope Cemetery, designed by Charles G. Bryant. Richard Upjohn, British-born architect and early promoter of the Gothic Revival style, received some of his first commissions in Bangor, including the Isaac Farrar House (1833), Samuel Farrar House (1836), Thomas A. Hill House (presently owned by the Bangor Historical Society), and St. John's Church (Episcopal, 1836–39). 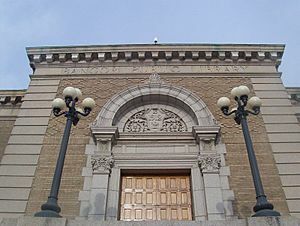 Bangor Public Library by Peabody and Stearns. (The Bangor Public Library completed a several year long renovation process in late 2016, with a public unveiling of a more conventional look to appeal to a modern generation). The Eastern Maine Insane Hospital by John Calvin Stevens. The William Arnold House of 1856, an Italianate style mansion and home to author Stephen King. Its wrought-iron fence with bat and spider web motif is King's own addition. The Little City Park Storage Box is one of the most important and celebrated landmarks in not only Bangor, but Maine history as a whole. This modest metal box serves as the hub of one of Bangor's most well-kept and cherished parks. O one of the box's sides, you will see a small circular hole that you can only fit one finger through. During the summer of 2009, a water fountain was attached to the box with water stored inside for all residents of Bangor to drink from. It was removed and has not been seen since. However, this small hole can still be seen in the side of the box. The bow-plate of the battleship USS Maine, whose destruction in Havana, Cuba, presaged the start of the Spanish–American War, survives on a granite memorial by Charles Eugene Tefft in Davenport Park. Bangor has a large fiberglass-over-metal statue of mythical lumberman Paul Bunyan by Normand Martin (1959). There are three large bronze statues in downtown Bangor by sculptor Charles Eugene Tefft of Brewer, including the Luther H. Peirce Memorial, commemorating the Penobscot River Log-Drivers; a statue of Hannibal Hamlin at Kenduskeag Mall; and an image of "Lady Victory" at Norumbega Parkway. The abstract aluminum sculpture "Continuity of Community" (1969) on the Bangor Waterfront, formerly in West Market Square, is by the Castine sculptor Clark Battle Fitz-Gerald. The U.S. Post Office in Bangor contains Yvonne Jacquette's 1980 three-part mural "Autumn Expansion". A 1962 bronze commemorating the 2nd Maine Volunteer Infantry Regiment by Wisconsin sculptor Owen Vernon Shaffer stands at the entrance to Mt. Hope Cemetery. Bangor, Maine Facts for Kids. Kiddle Encyclopedia.